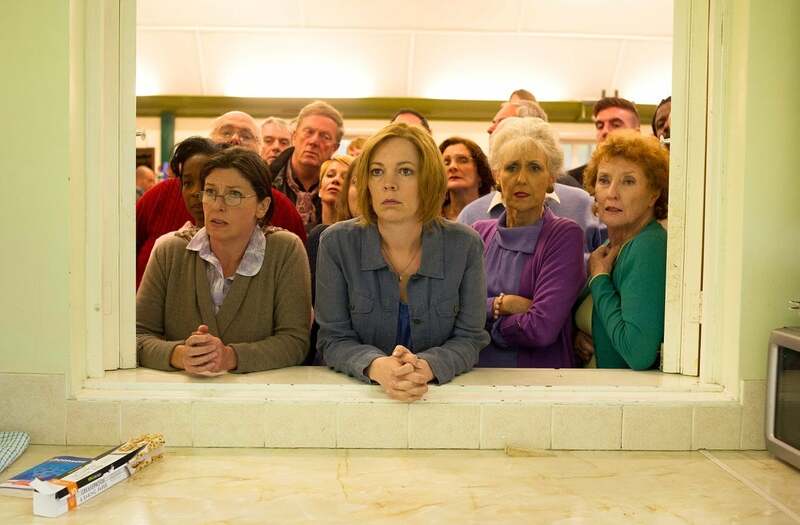 The National Theatre’s musical London Road has been made into a film, opening today. Looking at a community’s response in harrowing times – the filming itself became an opportunity to bring a community together. The film features an ensemble cast that includes Olivia Colman, Clare Burt, Rosalie Craig, Anita Dobson, James Doherty, Hal Fowler, Kate Fleetwood, Linzi Hateley, Nick Holder, Claire Moore, Michael Shaeffer, Nicola Sloane, Paul Thornley, Howard Ward, Duncan Wisbey and Tom Hardy. A Cuba Pictures / National Theatre production, the film is produced by Dixie Linder, and executive produced by Nick Marston, Tally Garner and David Sabel. BBC Films, the BFI Film Fund, Arts Council England and LipSync financed the project. The filmmakers were based in Bexley’s Sutherland Road between March and May last year, using many local houses as locations. Despite being based there for so long, they enhanced the sense of community in that area, thanks to a sensitive and neighbourly approach to their work. So much so, that the community is now looking forward to attending their own private screening of the film on June 14th. The intermingling of cast and neighbours peaked in a street party scene – when actors, extras and residents all joined in, on-camera. Sutherland Road resident Trish Elliott opened her home to the production, her front room becoming an interior for characters played by Anita Dobson and Howard Ward. “Anita Dobson’s my new best friend,” she jokes. “We really did get to spend some time together actually and she was a lovely person. I was home from work on a day that happened to be her birthday, and we had a little celebration. Mrs Elliott and her husband welcomed the filming. Being theatre-obsessed, they understood the process, and were happy to leave for work each day, allowing the filmmakers back in to do their job, for three months. Jane Whitefield, who lives nearby on Nelson Road, was equally happy to welcome the production – which used her house as the interior of the killer’s home. “We’d only moved in six weeks before so most of our stuff was still in boxes anyway,” she explains. “They’d leafleted the street, looking for a specific layout. The bay widow had to be on the right of the front door. The director Rufus Norris himself came to look around, and he was just lovely. We were flexible, and we thought it was fun. Mrs Whitefield agrees that the street party scene was a brilliant experience for the community. “We had just moved in to the area and it made us feel very welcome. Because we didn’t know anybody it was hard for us to tell who were the actors, who were the extras and who were the residents. Lots of houses on that street had been used for the film, so there were doors open and people coming and going all along the street. “We didn’t have to do much – we’re not about to join Equity. We just had to stand and walk. There was a lot of waiting in-between takes, so that was the chance for us to stop and get to know people. There was no ego and everyone was very friendly and very nice. “My sons were three and six at the time. My six-year old recognised Anita Dobson from Gigglebiz – he thought it was so cool. The boys were invited to come in and look through the camera while they were filming. It was an impressive piece of kit for children to watch being used.